Soon after the introduction of the motor car came the introduction of motorsports. Our inherently competitive nature driving us in our search for speed and steering what was one the greatest inventions in human history towards its inevitable competitive use. 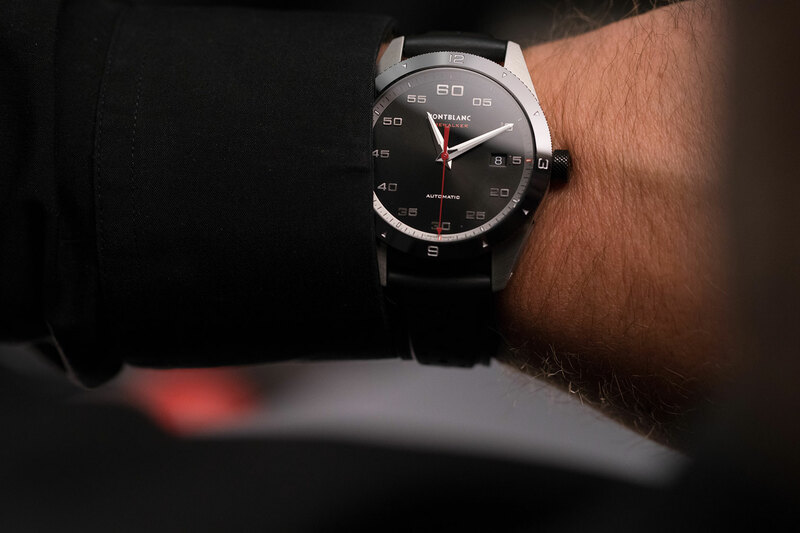 From motor racing’s early days, timepieces were used to measure the difference separating victory and defeat, and, ever since, cars and watches have cosied up in the back seat with an inexhaustable (unlike these fast-paced puns) roll call of pairings. At the beginning of the 1900s, one of the main players in motorsport timekeeping was Minerva. The manufacturer was one of the first to produce movements capable of precisely measuring fractions of a second. Fast-forward to the 21st century, and Minerva’s motorsport heritage – which is now part of Montblanc’s – is being honoured in the latest Montblanc TimeWalker collection. 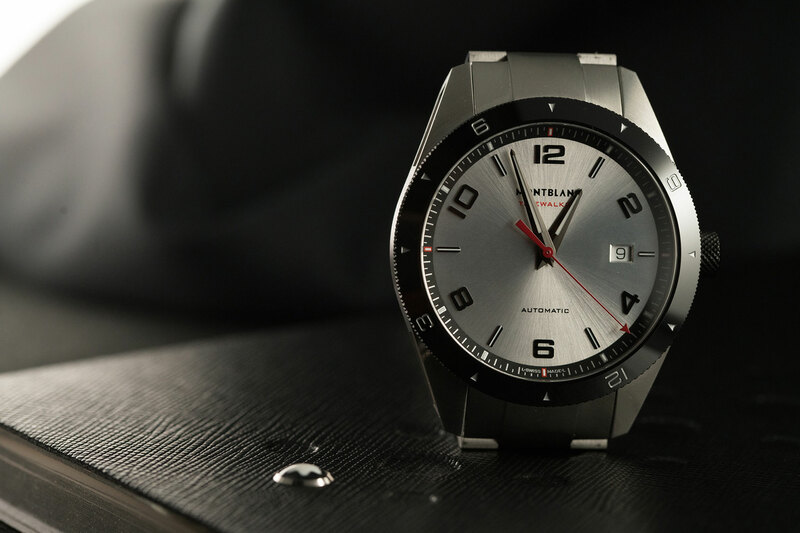 This collection is not only home to limited-edition rally timers and UTC chronographs but also simple three-handers – the black, and the silvery-white dialled TimeWalker Date Automatics. 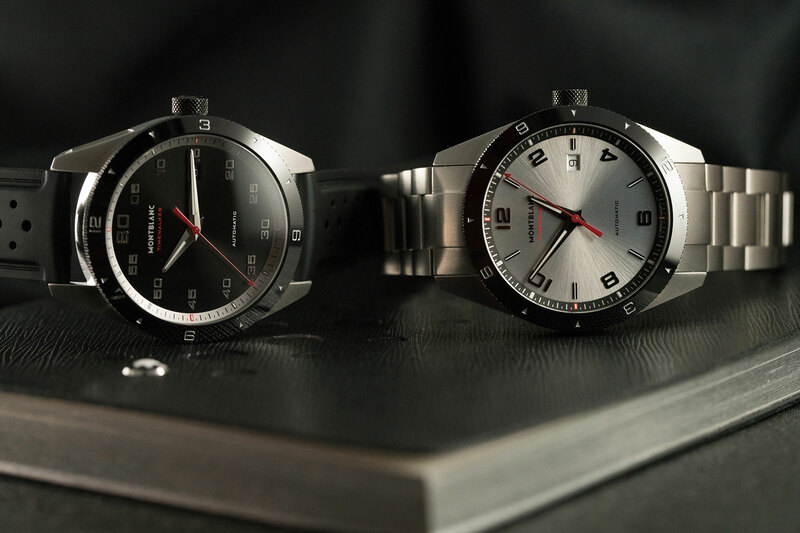 This sporty pair shares the same basic design architecture – clean dials with large Arabic numeral hour markers and a date aperture at 3 o’clock – with their only differences being the colour and layout of their dashboard-inspired dials. The hour markers of the black scale from five to 60 – reminiscent of the Minerva stopwatch dials at the beginning of the 20th century – while the silvery-white has a more traditional 12-hour format. Both are easy to read and youthfully modern, with contrasting coloured minute tracks given subtle red highlights that match the Minerva arrow-tipped seconds hand – a nod to the newfound heritage of the collection. 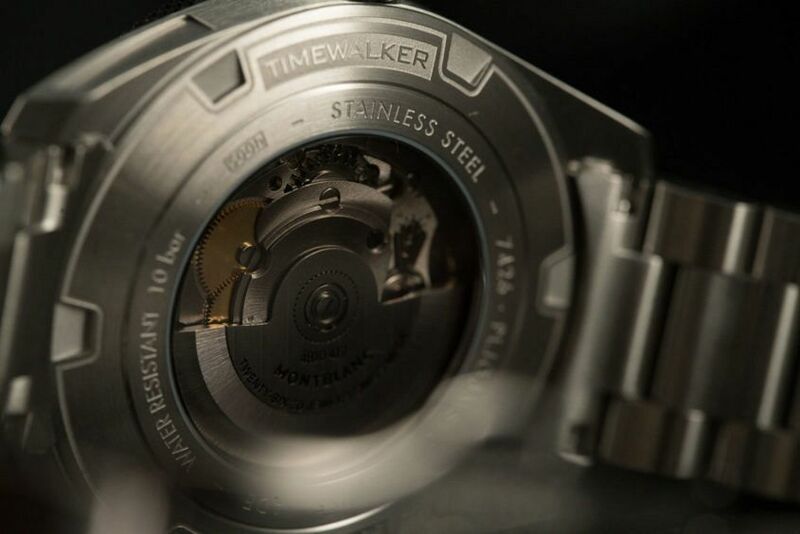 The imaginative automotive spirit of the new TimeWalker is further revealed in the details. 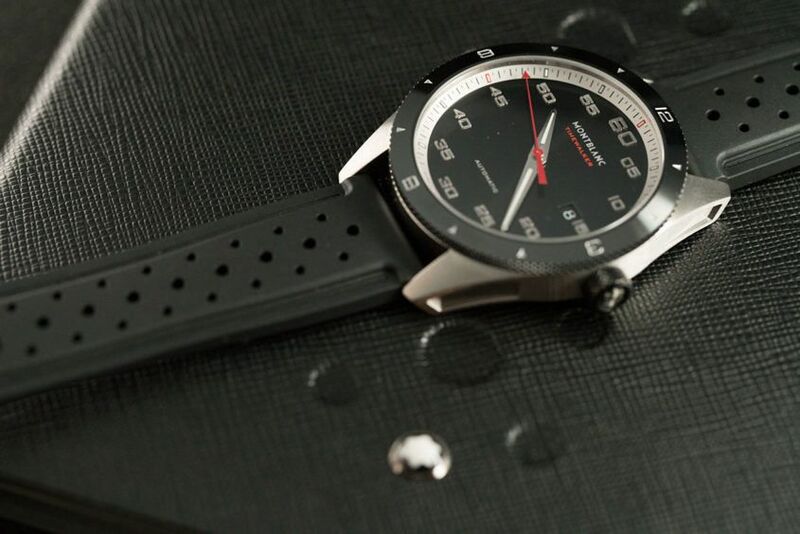 From the knurled finishing – like that on vintage race car petrol caps – of the black DLC crown and grip of the ceramic unidirectional bezel, which also has the added functionality of tracking a second time zone, to the car-racing design codes implanted in the 41mm satin-brushed stainless-steel case, with the latest version of the TimeWalkers trademark structured cutouts on the case profile being inspired by the bonnet-mounted air intakes of a car. Squeezed between the lugs is either a stainless-steel bracelet or a perforated racing-style strap that is offered in rubber or leather. The engine idling away on the inside is visible through a smoked-sapphire display back and is the automatic calibre MB 24.17. It has a 38-hour power reserve and started life as a Sellita SW200 movement before undergoing Montblanc’s Laboratory Test 500, which simulates the first year’s lifecycle of a watch through a series of tests performed over 500 hours. Sporty and functional, the Montblanc TimeWalker Date Automatic is ready for anything, on or off the road. Montblanc TimeWalker Date Automatic on leather or rubber, $4470, on steel bracelet $4920.